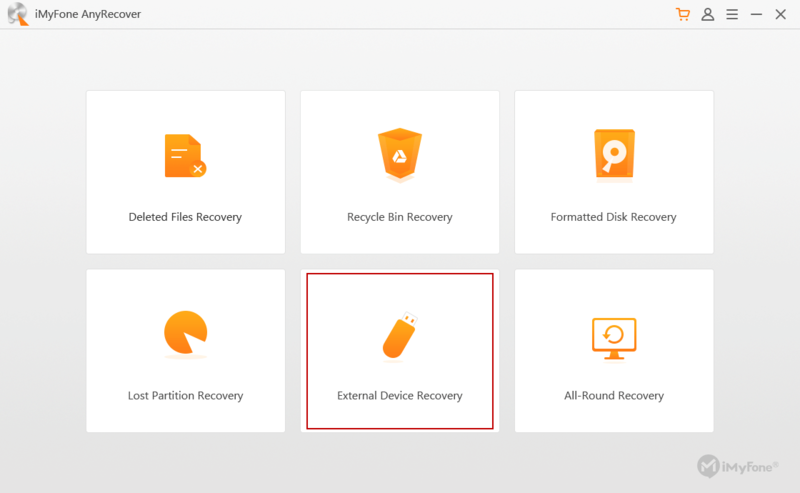 Launch AnyRecover and select "External Device Recovery" mode from the Home interface. You will have to connect your external storage device to the computer before the recovery process can commence. AnyRecover supports USB Flash Drive, Digital Camera, Camcorder, Memory Card, MP3/MP4 Player, SD Card, CF/SD/MMC Card, and other devices. Once your external device is connected, click "Next" and select the disk you want to recover data from. Then, check the file type and click the "Scan" tab. At this point, AnyRecover will take some minutes to scan for your lost files and list them with respect to file type. Preview the files and select the files to recover by clicking the "Recover" tab. If the "External Device Recovery" mode failed to find your files, you can try again by choosing "All Round Recovery" mode. The "All-Round Recovery" mode scans deeper for lost files more than "External Device Recovery" mode. When the scanning is complete, a list of recoverable files will be displayed, you can choose to click either of the "File View" or "Tree View" tabs to preview your files. Then, click "Recover" and select the appropriate/target location to save the files. Ensure you don't save the recovered files in the external device where you lost them.